Been dealing with the joys and complications of retirement. There I was with a whole lotta free days and just as quickly they got filled with wonderful things like writing, cooking, babysitting, visiting with friends and alas, health problems. Two heart stents later, a second delightful grandson and new digs in a safe neighborhood stabilized me and now I’m happy, happy, happy. So what do I do when I’m happy ? COOK UP A STORM ! It’s been cold here in Alameda, California. We’ve had unprecedented freezing high 20 degree weather here. Okay, you Mid-Westerners, stop snickering….. So what can I do but make SOUP! Spelt soup, mushroom barley soup, kale and potato aka caldo verde, everything green soup,Thai chicken soup, to name just a few but my absolute favorite is MINESTRONE. It’s easy and fail proof. You can pretty much put more or less of most ingredients in the recipe and you’ll end up with a rich, savory potage of green, red, orange, yellow veggies full of vitamins and minerals. Make a big pot and if it seems too much, put some in the freezer for later. You’ll love yourself when you defrost and heat it up after being out all day. Optional: Any chunk of dried out parmesan cheese to add to stock or grated parmesan cheese to sprinkle over completed soup. 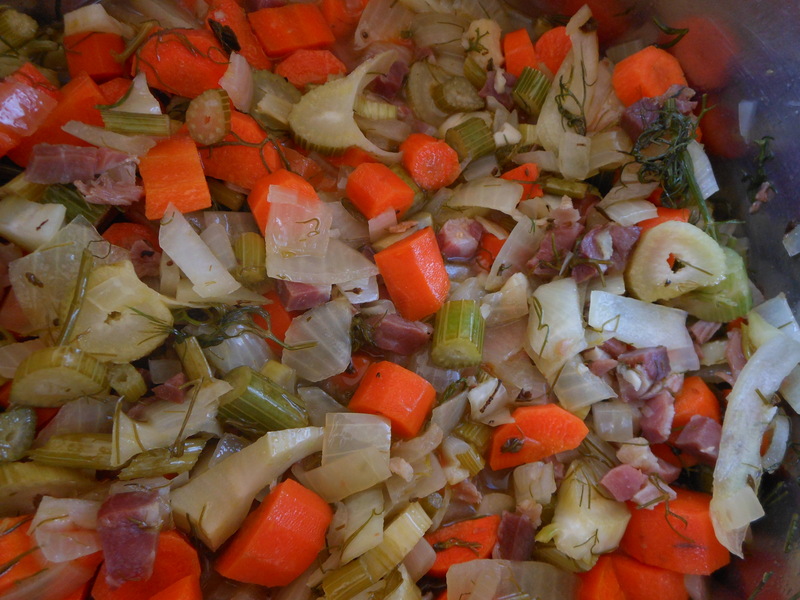 This will make about 10+ cups of soup so use a large stock pot that will hold about a gallon of soup. Saute’ pancetta in oil over low heat for 3-4 minutes. Add ingredients from onions through peppers and saute’ for 5 minutes. Add wine and bay leaves. Toss together, cover and simmer for 5 minutes. Add tomatoes with juices from can, paste, stock, basil and rosemary. Add swiss chard, cabbage,zucchini and beans and bring to boil. 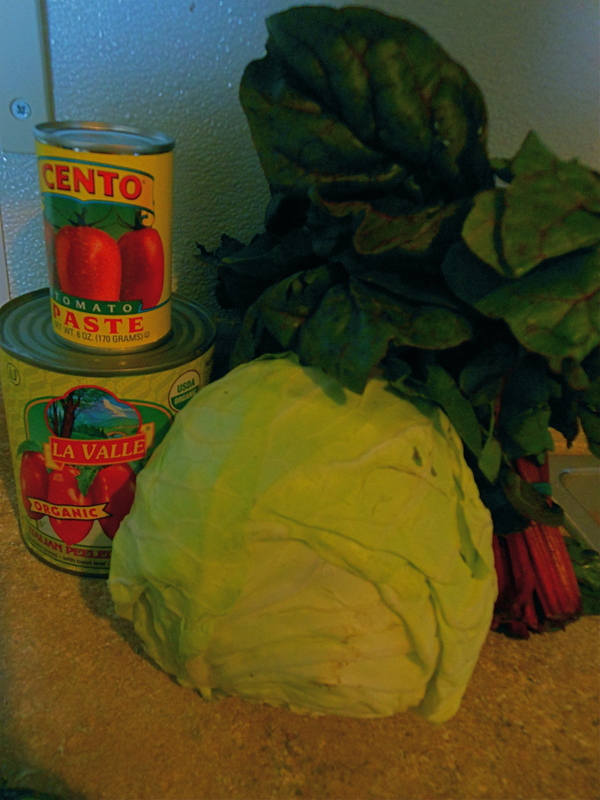 Simmer for 25-30 minutes until cabbage is soft and limp. Taste and add as much salt as you like. *You can substitute any salty bacon, prosciutto ends, leftover ham for this. ** Try to keep the proportion of tomato products and stock the same as recipe for balance but tweek it to your taste if you like. *** If you use whole canned tomatoes, squish them before you put them in the pot. 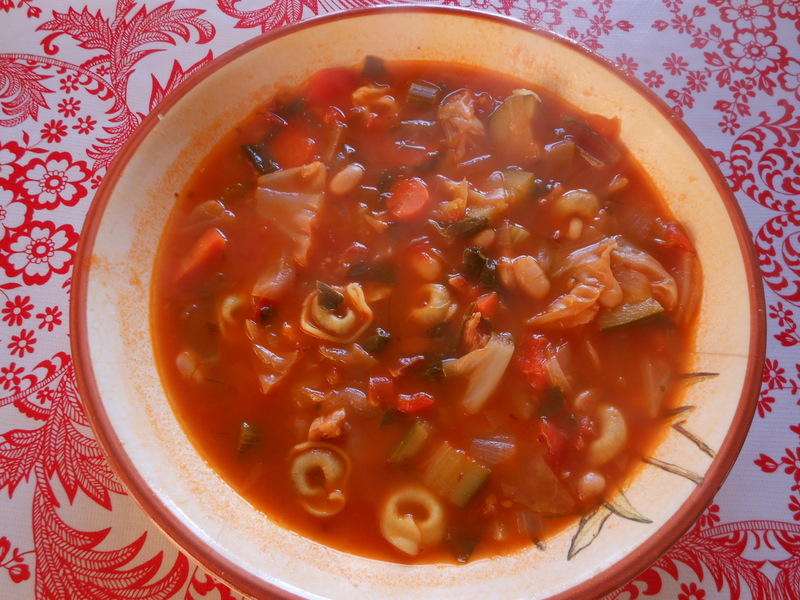 I like to add dried mini- tortellini or dried mini- ravioli to the finished soup. After soup is done, bring to a boil again and add about 1-2 cups of dried pasta and boil until the pasta is al dente. Got this idea from the Silver Palate cookbook. Love life every day, stay warm and good health to you all!